Ohio Gallia Democratic Party Chairperson Carole Roush announces she will be stepping back from her position. Ohio’s Fourth District Court of Appeals Judge Marie Hoover served as a speaker at the Gallia Democratic Party’s spring Kennedy Day Dinner Saturday - she also seeks reelection to the court. Candidate for the Fourth District Court of Appeals Valarie Gerlach was also a featured speaker. 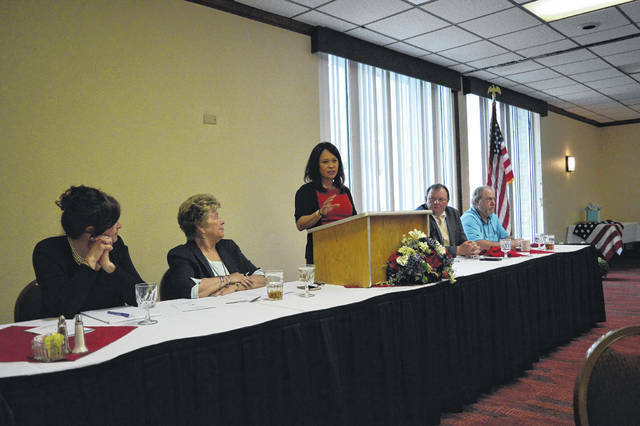 GALLIPOLIS — The Gallia County Democratic Party gathered Saturday evening for its annual spring Kennedy Day Dinner in the Quality Inn to recognize friends, new and old, and to prepare for the coming May primary. Candidate for Ohio’s Fourth District Court of Appeals Valarie Gerlach is making a bid unopposed in the Democratic primary for Ohio. She served as a speaker during the dinner. Gerlach said as a judicial candidate, one had to avoid speaking on issues or “firing up” or put down others and raise another up. Judge Marie Hoover, the first woman to serve on Ohio’s Fourth District Court of Appeals, took the podium next. Hoover would go on to explain that hashtags connect one idea to another. Hoover said she grew up in Pike County. Hoover attended college at Miami University and received her law degree from the Ohio State University. She served as a magistrate for the Portsmouth Municipal Court and as a law director for Waverly and solicitor for Piketon. Shawna Roberts, running for the US House of Representatives for district six also spoke before the assembled. She cited that several hundred women were running for Congress this year across the country and in Ohio she claimed over half of the congressional districts had women running in races. She encouraged everyday individuals to run for office if they had not because they would get the chance to meet potentially thousands of different individuals and get a chance to “help change the world.” Roberts previously spoke with Gallia Democrats in February. Gallia County Commissioner Candidate Randy Adkins and Gallia Auditor Candidate Jennifer Sipple spoke briefly to the crowd. Sipple cited experience in sales and as a business owner along with her masters in business administration as being something that provided her with the background to provide something new to the auditor’s office. Adkins has served as a Morgan Township trustee for nearly 20 years. Adkins cited the desire to challenge the opioid epidemic as a commissioner. He said he had been studying Gallia’s problems, acknowledged he could not fix them all, but wanted to make an impact. He claimed that 46 percent of the “county’s budget” went to dealing with the crisis. Gallia Democratic Party Chairperson Carole Roush honored Ray Matura, John Burnett, Louella Henry, Gallia Board of Elections Director Dale Whitt and Rob Jenkins all with lifetime achievement awards. Roush said this was her last year as the Gallia Democratic chairperson and would be spending more time focusing on family. She said she served in that capacity for the last 16 years and thanked all who supported her through the years. 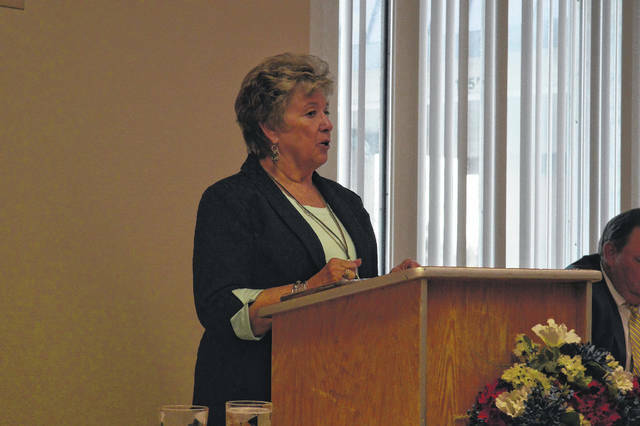 Ohio’s Fourth District Court of Appeals Judge Marie Hoover served as a speaker at the Gallia Democratic Party’s spring Kennedy Day Dinner Saturday – she also seeks reelection to the court. Candidate for the Fourth District Court of Appeals Valarie Gerlach was also a featured speaker.